Mangaluru, Apr 02, 2019: National Highways Authority of India’s (NHAI) request to close the dilapidated old arch bridge across the Phalguni on National Highway 66 at Kulur used by traffic from Udupi-side towards Mangaluru for safety reasons is not yet acted upon by the DK district administration. The old arch bridge constructed in 1952 is now a safety hazard, NHAI has informed DK administration. Consultants hired by the Union Ministry of Road Transport and Highways to examine the bridge’s stability have said that various components of the bridge have either become weak or corroded thereby rendering it unsafe and a risk. At the present, the bridge can take up to 30 tonnes of load with vehicular speeds restricted to 15-20 kmph and there is no scope for its further repair, the consultant said. As such, it proposed re-construction of the bridge. Stating that Dakshina Kannada MP Nalin Kumar Kateel had sought its reconstruction because of the poor condition, NHAI told the administration that a detailed project report for construction of a new six-lane bridge between the two existing bridges is almost ready. The new bridge would be part of six-laning the Nanthoor-NITK Surathkal Port Connectivity Project Road being taken up by New Mangalore Port Road Company, of which New Mangalore Port Trust too is a stakeholder. NHAI’s Regional Office in Bengaluru recently wrote to the district administration saying that the detailed project report and tender documents are likely to be ready by April-end. Construction of the new bridge would take atleast 18-24 months, including the tendering process, it said. As such, the office sought the administration’s order to shut down the old bridge for traffic in view of its dilapidated condition and arranging for alternative routes for vehicles. The NHAI has proposed to allow two-way traffic on the new bridge across the Phalguni [that carries traffic from Mangaluru towards Udupi] for commercial vehicles up to 16-wheels. Commercial vehicles with more than 16-wheels, on both directions (North and South), may be diverted via Surathkal-Kana-Bajpe-KPT, NHAI said. Meanwhile, light vehicles from Udupi towards Mangaluru may continue to use the old arch bridge, the authority said. The Subrahmanya Temple at Kulur comes on the alignment of the proposed six-lane bridge and both NHAI and the administration would have to resolve the issue. 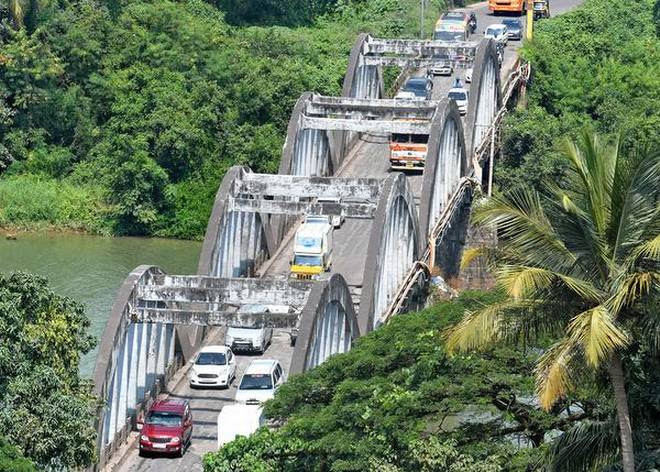 DK DC S. Sasikanth Senthil on April 1, Monday said that the administration will take a decision to close down the old arch bridge across the Phalguni near Kulur for traffic after counting of votes in the Lok Sabha elections. "Counting this time will take place at Surathkal (NITK) and we do not want to face traffic blocks due to the closure of the old bridge [Udupi-Mangaluru direction],” DC Senthil stated.